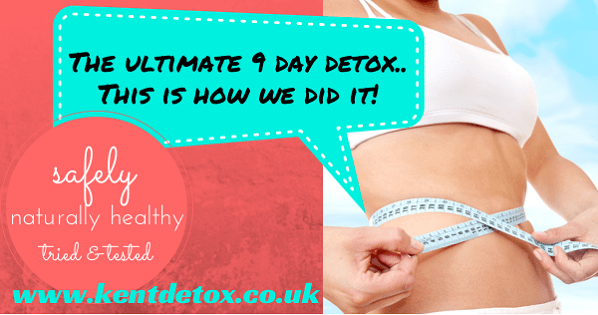 The 9 day cleanse we offer at Kent Detox is a very successful way of getting your body in a great condition where it functions at its peak and works the way you expect it to. Our 9 day cleanse has a powerhouse of ingredients that will support your body in achieving the results you are after. The simplest, yet most effective approach to the 9 day cleanse is to talk to our therapist. Each person has an individual medical background and personal goals. The day before you start – most people start off with a colonic. If you have not had one before, then read more about colonics here. It’s not compulsory, but enhances the effectiveness of the programme as you start off with one of the organs already clean and fully hydrated. Day 1 & 2 – these can be tough as your body will be eliminating things like sugar, carbs and caffeine. Some clients struggle with it and others just fly through it. The products will give you everything you need will be given to you with clear instructions so you will know exactly what to do and how to plan your day. You are on your way to a healthier, happier. Getting past the first two days is the toughest. You need to be serious about improving your life and losing weight. The results are worth it, so stick to it! Day 3 – 9 – the following six days we will focus on alkaline foods, further cleansing, blood sugar regulation and topping up all the vitamins and minerals your body needs. Most people start feeling a very positive difference on day 3 or 4 when the products have taken full effect and the body is no longer going through withdrawal. Your weight may fluctuate from day to day. Adhering to the programme will help your body continue to purge itself of harmful chemicals and begin burning your fat stores. You will be asked to take measurements and a weight reading on the day you start, then on days 3,6 and on the morning of day 10 when you have completed the course. Some clients take photos to track their journey and it is a powerful way of seeing the effect the 9 day cleanse have on your body, skin and overall shape. We dedicate our team to support you every step of the way.